Matters not if wine is destined for chef or pan, you'll be prepared. This lead-free crystal glas..
Dimensions: 5" x 5" x 10" Disclaimer: Ships to ..
Italesse Champagne Flutes Set of 2 (P/N 17426). Introducing the next-generation of mouth-blown..
Lucca Bordeaux Glasses 6 Stems (P/N 150.02.01). 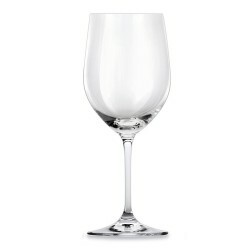 These stunning machine crafted glasses are lea..
Nambé Tilt Wine Glass (P/N 5530). The graceful tilt of these elegant full-lead crystal ..